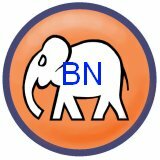 What kind of dialogue to resolve issues in electoral system if EC does not bother to recognize Bersih NGO as a legal entity? As a public knowledge, if the electoral system is not tainted, not just the five states came under opposition rule, the Federal government might be under PR after GE12. Bar Council is pro Bersih, not pro opposition. Only BN propaganda machines tries hard to slander Bar Council a pro opposition for its neutral and unbiased views on political affairs in Malaysia. Why should you learn from Singapore, a country with a poor standing in free press and human rights record? What don’t you learn the right example from Hong Kong and Taiwan, another Chinese dominated countries where peaceful street demonstrations are a norm, and no police-incited violence as we see in Malaysia. Go see things beyond Malaysia and read more news from the reliable news sources other than The Star, NST and TV3 to know there is an event called peaceful demonstration in the world. No peaceful demonstration in Malaysia because the law enforcement police who suppose to maintain public order is the one creating havoc by beating anyone in the street, back lane and restaurants and FRU is attacking crowd indiscriminately with the teargas and chemical-laced water cannons. 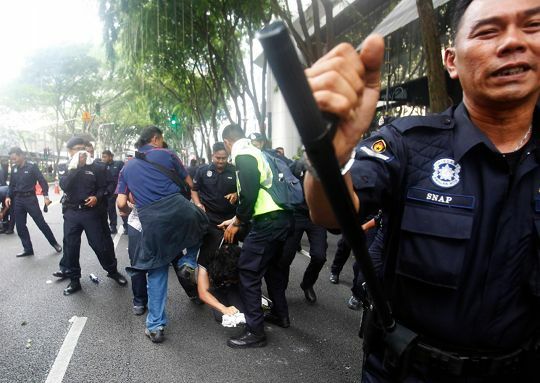 Instead of apprehend those provocateurs in the rally, the Malaysia police went amok by retaliating with violence and assaulting anyone as they like. PDRM has very poor professionalism in policing SOP, it’s no different than a legalized gangster, street hooligan and a private army for UMNO politicians. Admittedly, there are many good and honest policemen in PDRM, but a number of bad apples in the forces have tarnished the whole image of PDRM. People only see a black spot on a white cloth because we expect the police is like a perfect white and clean cloth. You can be a good Samaritan for 50 year, but once you commit a crime like molesting a teenage girl. The crime is your black spot in your life, other 1000 good things in your life will not cover a black spot. The lasting impression on PDRM is the black spot widely captured in youtube videos, not the image projected in the doctored BBC video aired by Astro. I hope this lady don’t get raped and assaulted by no other than policeman in the blue color uniform for her blinded trust placed on the PDRM in one day. God blessing her! COLUMNIST Azmi Sharom’s views always make a good read, but his article on “Peaceful assembly a legal right” (The Star, May 3) was totally biased and a disappointment. I agree on the peaceful assembly right, but we do have laws on the venue and situations to adhere to and the rights of other Malaysians to consider. In Singapore, they have a speaker’s square where citizens can go and vent their frustrations. But they have to do it within the laws stated. The writer is advocating lawlessness and total disrespect for authority. His article is encouraging street demonstrations and violence. I do not believe there can ever be a peaceful rally, as there are bound to be provocateurs. Whatever unhappiness, dialogue is the best and only solution. A good many demands of Bersih 2.0 had been met, yet they managed to come up with another set of unreasonable demands. When will it end? I am one of the silent majority who want my peaceful Malaysia back, before the days of Datuk Seri Anwar Ibrahim, who is hell bound on taking over Putrajaya at all costs, even if it means destroying the country. I do not think the writer is that naive to think the rally was all about reforms. If our election process was tainted, pray, please tell me how five states came under Opposition rule? Bersih 3.0 did nothing but paint a very bad image of our beautiful country in the eyes of investors and tourists. April 28 will be remembered as a black day for our nation; professionals and educated men and women behaving like hooligans on the street. I do also wish the Bar Council will not continue to be pro-Opposition, because the ordinary citizens expect them to be neutral and fair. I heap praises on our police force for restraining and controlling the crowd, and not letting things become another London riot where people were killed. Keep it up you Men in Blue, we are proud of you.